Calvin Barr is the personification of the Greatest Generation. He already did his part during WWII and now he might just save Canada. Apparently, there really is a Bigfoot, who is spreading a doomsday virus across the great white north. Obviously, this is a job for the titular hero of Robert D. Krzykowski’s The Man Who Killed Hitler and Then the Bigfoot (trailer here), which opens this Friday in New York. Barr is now old and disillusioned, but when he was young, he was a hardworking, patriotic American. He was also deeply smitten with Maxine, the great love of his life, but alas, it was not to be. There were separated first by the war and then by her untimely death. Most frustratingly, Barr was even denied the solace of her correspondence, due to the sensitive nature of his service. The mild-mannered Barr excelled at behind-the-lines work, so was entrusted with the most hush-hush top-secret mission of the war: killing Hitler. In the somewhat present day, Barr is sick of killing and still heartsick over the loss of Maxine. He mostly haunts a barstool, but he still finds time for Ed, his ever-loyal little brother. When “Flag Pin,” a shadowy Fed and his Canadian counterpart come asking for his help, Barr initially turns them down flat, but he eventually agrees. After all, he is still part of the Greatest Generation—and his nation needs him. TMWKHATTB sounds like lunacy, but it is surprisingly poignant. Instead of an Inglorious Basterds romp, this is an elegiac ode to an action hero’s fading glory. Arguably, Elliott’s Barr belongs in the company of Michael Caine in Harry Brown, Clint Eastwood in Gran Torino, Ron Perlman in Asher, and Jackie Chan in The Foreigner. In a more just world, Sam Elliott would be nominated for this film, rather than A Star is Born (which is a remake of a remake of a remake of a film from 1937). Barr is cut from similar cloth as Lee Hayden, his character in The Hero, but the aging commando is an even more poignant and messily human figure. As Barr, every one of Elliott’s wrinkles tells a story. Aidan Turner does not have the same kind of presence as the younger Barr in his Hitler-killing scenes, but he develops some nice chemistry with Caitlin FitzGerald, who is quite touching as Maxine. Weirdly, their sweet, ill-fated romance is one of the best things going for the film. However, it is Larry Miller who really brings it home as the devoted Ed. Who knew he had such a sensitive performance in him, especially in such an unlikely genre film? Oddly, killing Hitler is the least interesting part of The Man Who. Of course, it is physically and constitutionally impossible for Elliott to be uninteresting. Krzykowski short-changes viewers several obvious and necessary payoff scenes, but his characterization is quite strong. 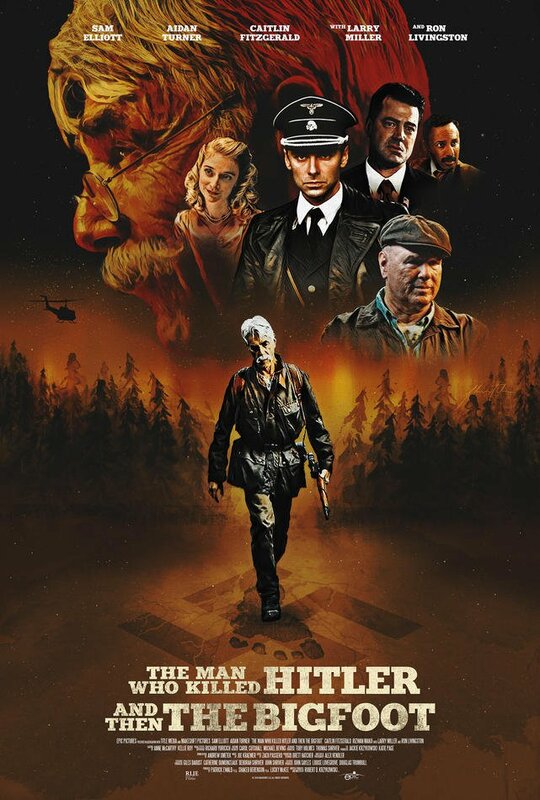 Recommended for fans of more sophisticated action-adventure movies, The Man Who Killed Hitler and Then the Bigfoot opens this Friday (2/8) in New York, at the Village East.